The police code 999 means “officer down”. 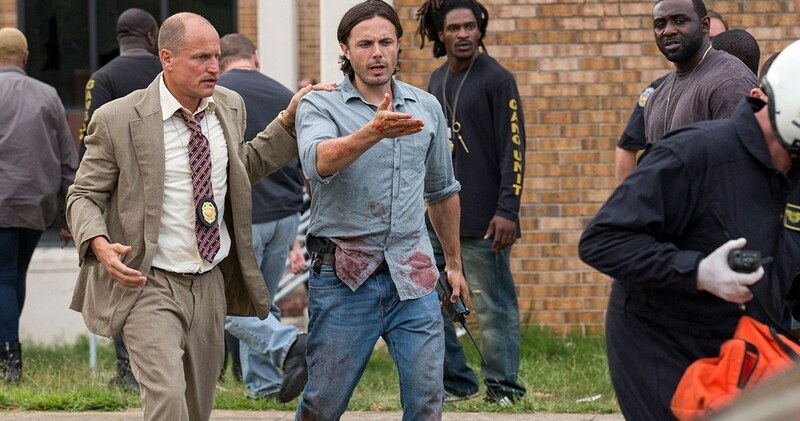 In this film written by Matt Cook and directed by John Hilcoat, triple 9 takes on a sinister and convoluted tale of crime and betrayal. Filled with an all star cast, it's sometimes hard to get a grasp on the who's and whys of the plot. The story hits the ground running with a bank robbery by a well trained crew of bad guys that turn out to be police officers. Then Kate Winselt shows up playing a cold blooded Russian mafia boss. No denying the movie is a thrill ride. Michael Atwood (Chiwetel Ejiofor) is the leader of the crew setting the job for the heist. The reasons why are slowing revealed as he's the father of the mafia queen's sister's son. Irina Vlasolv (Kate Winselt) is shown reading stories to the little boy being the kind and caring aunt, then the next minute she is sending off a young couple to a messy demise. Atwood is roped into doing another job for Irina with his son's life on the line. Irina is trying to get her husband out of jail in another country. The evidence she needs to squash is in the Atlanta Homeland Security Depot, which is almost impossible to breach. The only way to get in is to divert the police. And nothing is more diverting than a call of “officer down”. The crew once worked with Atwood an ex-Special Forces soldier for Black Water. Some of the crew came back to civilian life getting jobs as cops. Russel (Norman Reedus) brings his brother Gabe (Aaron Paul) into the mix. Gabe used to be a cop but was fired. He put the bank heist in jeopardy by stealing some of the cash, which blows up with red smoke in the getaway van. This leads to a car chase and shootout. Gabe who is already a liability to the crew is not comfortable by the new plan of triple 9. He tries to get his brother to not go through with it until there is a game changing tragedy. Meanwhile Detective Allen (Woody Harrelson) has been put in charge investigating the bank heist. He doesn't know that his nephew Chris Allen (Casey Affleck) has been given a new partner Marcus (Anthony Mackie), who is part of the crew. The neo-noir thriller is filled with grounded in reality urban crime like gang battles and the actual police work. The story builds up slowly adding character development about the who's and why's while rolling like a boulder downhill gathering speed. Detective Allen relies on his police instincts in connecting the dots, while Marcus is fighting his own guilt in having to take down a fellow officer so they can do the next job. There's lots of violence, severed heads, Winselt eating up the screen as a truly cold calculating mafia queen. As good as the cast is, the story seems mired down in trying to explain much between action sequences, keeping the audience questions at bay. Despite it's faults, it's a taunt well made dark film that is if nothing else entertaining.